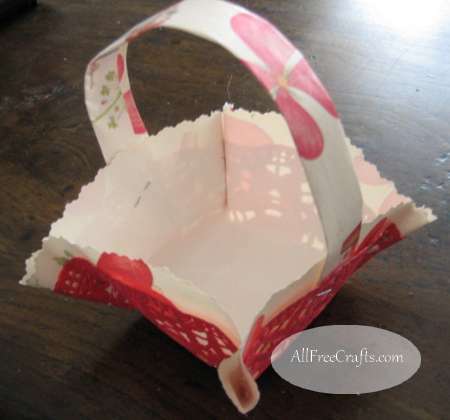 Make as many paper Valentine baskets as you need using simple origami paper folding then fill the baskets with sweet treats and little surprises for gift-giving on Valentine’s Day. These little baskets are also a perfect size for three or four special cookies, small cupcakes or a few two-bite brownies. 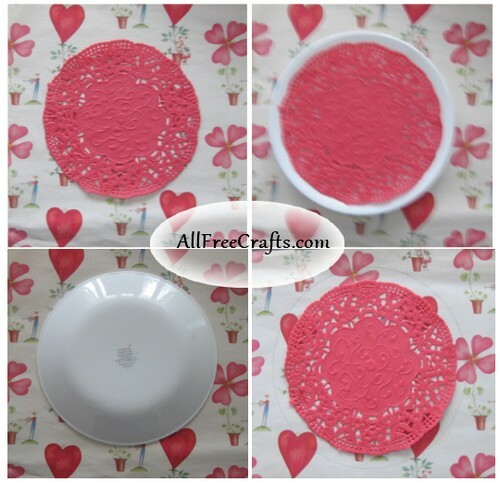 On construction paper or wrapping paper, trace around a plate just a little larger than the paper doily. Set a sandwich plate (or similar circle-shape of the right size) on top of your construction paper or wrapping paper and trace around it using a pencil. Cut out the circle with scissors. 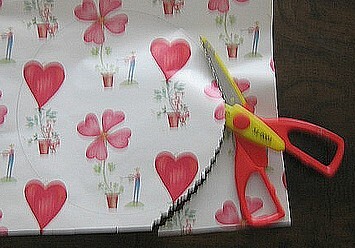 If available, use a pair of pinking shears or decorative edge scissors for a lacy edge effect. Center the doily on top of the paper circle. 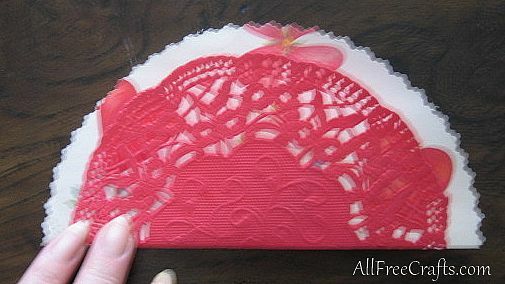 Fasten it in place with a small piece of double-sided adhesive tape placed in the middle or a small drop of craft glue. Fold the double circle in half and in half again so you now have a quarter circle like a large piece of pie. Place the point of the pie toward you and fold it up to the edge, as shown here. Press down all the creases quite firmly as these are the origami lines that will form the basket shape in just a minute. Unfold and put a staple in the right hand corner, then in the opposite corner. Open out and fold again in the opposite direction so that you can staple the other two corners in the same way. 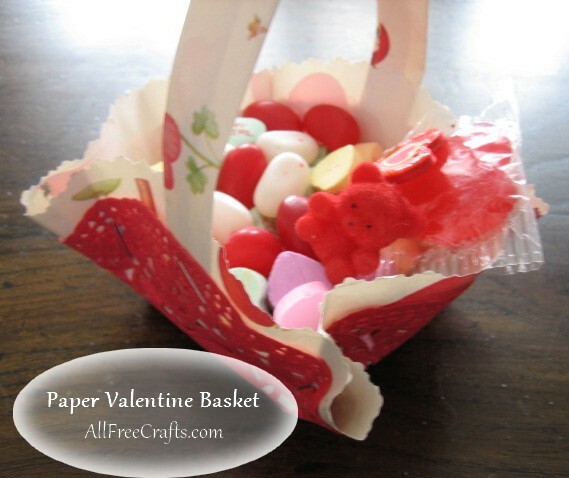 Paper circles start to take on the square shape of the Valentine basket. When you open out the circles and gently push down the bottom – lo and behold – they will become the basic square shape of your Valentine basket. Take a pencil and push the tip into each of the stapled corners so they open up into little cone shapes. Wrapping Paper: Cut a 10 inch by two inch rectangle of wrapping paper and place it wrong side up. Working on the top long edge, fold the top third of the rectangle down, then fold the bottom third of the rectangle up. You should now have a long paper strip with the printed design on both sides. Construction Paper: Cut a 10 inch by two inch rectangle of construction paper using straight scissors or pinking shears for a lacy edge. Ribbon: Simply cut leftover ribbon to the desired length. 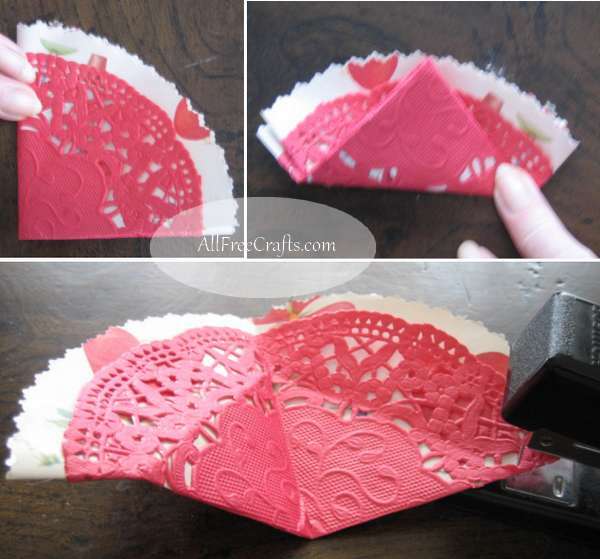 Insert one end of the handle between the doily and the paper at the center of one side. Staple in place. Repeat on the other side. 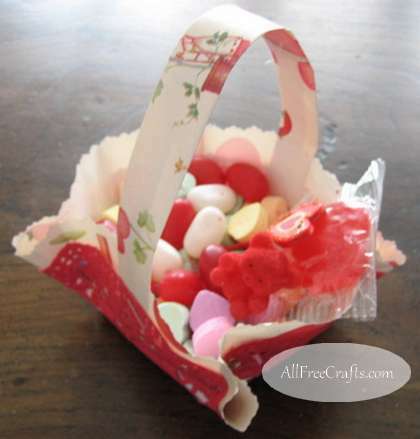 Fill the basket with candy conversation hearts, red and white jelly beans or other Valentine sweets. You could also tuck in a heart shaped lollipop or two, and maybe Valentine erasers, a tiny red flocked teddy bear, a little cupid’s doll, a wee angel, or a Valentine’s Day lucky charm.